Deadlier than the Male, the tabloids said. They didn’t know the half of it. When reviewing Russel McLean’s previous novel Cry Uncle, I used the following sentence, “The gritty and honest narration has a truly Scottish attitude.” This is also true, perhaps even more so, of his newest book Ed’s Dead. McLean has already established himself as a Scottish crime writer with his hard-boiled McNee series set in our very own Dundee. With his latest novel, there is a huge shift in voice, as well as in location, though we, of course, remain in Scotland. Needless to say, Ed’s Dead maintains all the wit & grit that readers of the McNee series expect from McLean. Interviewed before the release, he revealed that he wanted to create a woman protagonist who comes across as real – women we all know – not stereotypes: the challenge of writing in a first person female narrative. 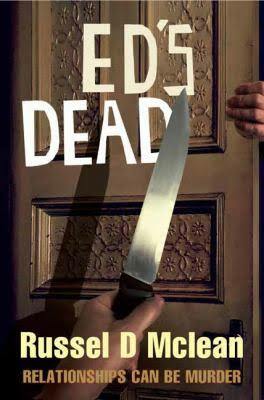 So I asked myself, could Jen, the protagonist of Ed’s Dead, be a real skin-and-bone person? Hell, yes. She is not unearthly intelligent, nor some acrobatically gifted assassin; she is you or me, in extreme circumstances. These circumstances are triggered by the accidental death of her crappy boyfriend, and led to Jen being named The Most Dangerous Woman in Scotland. While this may seem like a big jump, but the plot twists and turns just right, with equal measures humour and violence. We are with team Jen as she tries to escape hardened gangster Buchan, his hitmen, the police (some corrupt, naturally) and the media. We are hooked by the interiority of the narration, the insight into her thoughts and motives as she wings her way through the dangerous world she finds herself part of. Ed’s Dead blurs the boundaries we have between good and evil. Murder is evil, right? What if it’s an accident? Self-preservation? Response to Blackmail? What kind of person does it take to be a killer? The internal struggles these questions posed are handled with psychological diligence as the novel asks readers if they’d do in the same circumstances. Ed’s Dead brings the ‘thriller’ into the land of the everyday. The way in which the other characters react to Jen’s actions adds texture to both the plot and the themes of gender and morality as reactions would in all likelihood be different if it were a man was in the same situation. McLean’s short sentences and dead-pan style create pace; it’s quick and deadly. Tensions rise as bodies fall. However, this does not result in an abandonment of the occasional lyrical prose on the city: “The rain falls in a gentle mist. The night is cold but not freezing. There is a stillness in the air. Expectation. The city is waiting for something to happen. Holding its breath.” Setting and location are handled vividly; McLean paints an edgy picture of a Glasgow he clearly knows like the back of his hand. The abandoned structures in Kinning Park loom out of the darkness like monsters from a nightmare. The darkest corners of the city are exposed, enhanced by a harshness of tone and a hint of Scottish dialect. The novel takes in other themes too: family relationships, morality and death, coping mechanisms, Scottish politics, media…the list goes on. To put it simply Ed’s dead is brilliantly dark and disturbing. It’s also brilliantly funny, and brilliantly Scottish.